Howard K. Pollack was born and raised on Long Island. A Brooklyn Law School graduate, he has had a distinguished career as an attorney for over 27 years. While he enjoys practicing law, his first love has always been writing. Beginning simply as a hobby in high school, writing has grown into a passion that has become a dominant force in his life. 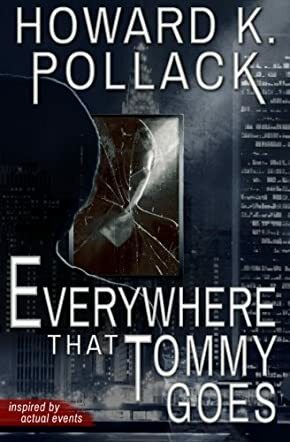 Howard Pollack has conceptualized and developed a brilliant suspense novel in Everywhere That Tommy Goes. The author introduces us to Tommy, a seemingly ordinary fellow who suffers from intense migraine headaches. Tommy gets into a fight, only to be rescued by his new friend Troyer. But when a bartender turns up murdered, Tommy becomes the prime suspect. Gradually, he begins to question the actions and motivations of the engaging Troyer Savage. The man has an Aussie accent and can charm the skin off a snake and yet, Tommy is strangely attracted to the man. And then, another murder takes place and Tommy wakes up to find himself covered in blood and on the run. As the police begin to build a strong case against Tommy, Troyer disappears and Tommy begins to question his own sanity. He is unable to separate the nightmares of his own reality from the possibilities of an experimental drug which tend to skew and blur the lines of fantasy and reality. This is a beautiful psychological mystery in which reality and paranoia produce an increasingly more intense plot. Tommy's character is wonderful in that the reader will sympathize with the man and be suspicious of him at the same time. The plot is developed with intrigue and precision and author Pollock comes off like a skilled story surgeon in command of the scalpel. Even when you get the clues, you're not sure what they really mean. Everywhere That Tommy Goes will keep you guessing until the very end. And then, you will have to guess again. Every once in a while I discover a mystery thriller with a plotline so original that it renews my faith in the genre. This book took me on an unexpected journey that grabbed ahold of me and entertained me from page one all the way to the very end. I'm usually pretty good at figuring out what's going on by the time I get half way through a story, and I absolutely believed that I knew where this book was going too, but I was wrong, and the ending floored me. The reveal is so well done I actually found myself skimming pages again trying to spot some of the clues I missed he first time around. If you consider yourself a crime sleuth, and dare to challenge your deductive skills, then this book is a must read. I loved this book. It started fast and never let up. Lots of twists and turns that kept me guessing. I could not put it down and read it over the weekend. Full of surprises until the very end. Some great characters that get into your heart and under your skin. This one is a 5 star for sure. It seems like so many lawyers have turned to writing crime fiction these days. Some do it well, others don't. Pollack's story impressed me because it was different and the characters came off so real. I got totally engrossed in the story too and couldn't stop reading. But I have to say that as good as this book was, the ending was even better. It shocked and surprised me so much because it was so clever and unexpected. Great read. I couldn't put it down.... A must read! 5 stars in my book! Excellent book - very well executed - a real page turner... Waiting for the next book! This book grabbed me right away and kept me guessing all the way through. A serious page turner with great characters and an action packed plot that was full of surprises. Loved the unexpected and crazy ending. Pulse pounding action filled with plot twists that keep you guessing until the end. What a great ride. Thriller lovers won't be disappointed with this one. Nonstop and fast paced. If looking for a fresh mystery writer check out this book. Furiously paced - explosive to the end! Fasten your seat belt... Mr. Pollack keeps you on the edge, page after page!! Cool book. I can't wait for the movie. Read this one on my Kindle over the weekend after finding it on Readers' Favorite. Great website that has turned me on to a number of awesome books. This one rates with the best of them. Watch out for the ending. Awesome read. I could hardly put it down. I am not a heavy reader as I have problems concentrating but this book kept my attention. Mr Pollack has a winner here. I have already purchased 2 more copies to give as gifts. Can't wait for his next offering and highly recommend ! This was a quick, enjoyable read... I had a hard time putting it down. From the beaches of Long Island and the Jersey shore, to the grimy sides of NYC to the wooded areas north of the city, the scenes reinforced the suspense. I wasn't quite sure how it would end, and had to re-read, to make sure I know who really did it... Nicely woven and easy-to-read, a pleasurable suspense thriller. Very cool storyline that drew me in right away. Creative plot with some interesting characters too. I loved the book though I had some trouble with some of the detectives. Still a five star for me. I went back and forth thinking I knew what was going on, but in the end, I was left surprised, with a smile on my face and a clever nod to the author. He kept me going all the way through to the very end. Damn good book with a terrific ending. Not surprisingly, this book won the Mystery-Murder category for 2015. Our book club loved the story and spent hours rehashing the subplots, surprises and teasers that led us astray. So well done and woven together with characters that made us laugh and sent shivers down our spines. Great book with a shocker ending we never expected. No one in the group had it all figured out. A totally rocking thriller with subplots galore and red herrings that lead you astray. Very cool and ingeniously structured story-line enhanced with lifelike characters flawed, loved and hated. Just what you want in a book that takes you on a journey and grips you to the end. I couldn't put this one down. Definitely a must read that hasn't received the attention it deserves. The best thing about this book is that while it seems to be predictable it is anything but. Question everything, then guess again, you won't know what is going on until the very end, and then you will still have to rethink it. This book takes the mind game to the next level. Great stuff. I loved this book. So well written and deep. The undercurrents were there for avid mystery readers but you had to go beneath the surface and really think. I was surprised and captivated when the story went from first person to third person and developed perspectives from unexpected angles. The ending blew me away too and left me hanging, which intrigued me and pissed me off all at the same time. Come on man, how does the story finally end? Wild ride reading this book. Crazy ending I didn't expect. Interesting perspective going from first person to third person and mixing it up. I enjoyed that. Tommy character is deep and keeps you on edge. Did not want to put it down. Great book, who is this author?